The 08/07/12 Rainfall is now more than Ondoy's. And to think its not even a Typhoon. Hi Coffeeholics. How are you guys? Its been raining constantly for several days already. Classes and work has been suspended due to the floods and rain. I hope and pray that all of you are safe and sound and dry in your own homes. I am one of the blessed people who live in a place where there aren't any flood so our whole family is snugly safe at home. 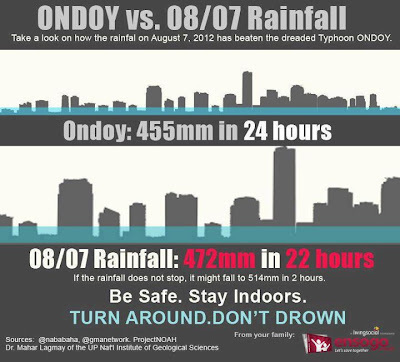 Still our hearts go out to our kababayans who are stranded and whose houses are flooded. Our prayers are with you all. I've been blog hopping throughout the day and stayed in tune on twitter, fb, and the news with whats happening and I decided to compile information on what we can do for our kababayans right now like donation centers or locations. If you are on twitter the best way to check is by searching #ReliefPH. UPDATE: Please make sure that the place you are donating your items to are GENUINE. Unfortunately there are people who will take advantage of all this generosity. But there's still good news. I just read on twitter that and ANONYMOUS PERSON donated a WHOLE TRUCK OF RICE (bigas). Hearing such things.. giving out whether big or small really is heartwarming. Truly it is in the face of trials and difficulties we all learn to work together. God bless you guys! 1. VINZON'S HALL, UP Diliman. You may drop off donations starting tomorrow at Moonleaf Tea Shop Maginhawa, thank you! 4. MAIN HALL, Barangay Payatas, Bulacan St.
McDonald's stores open in Metro Manila are now accepting donations in kind (rice, noodles, canned goods, etc.) for flood victims. RT Stefano Panlilio Lin: San Juan Red Cross needs lots of cooked rice to compliment the dishes/viands donated for San Juan Evacuation Center located in the gym behind the San Juan City Hall. Uncooked rice also welcome, but they need a place to cook rice donations. Plastic utensils/sporks, paper plates and drinks donation also welcome. If interested to help, please get in touch with Stef at 0917-5648112. #ReliefPH All Ayala Malls are now accepting donations for flood victims. These may be turned over to concierge booths in all our malls. 11. DILIMAN PREPARATORY SCHOOL at Commonwealth Ave. Victory Ortigas has begun accepting donations at its Victory Center on the fourth level of the West Wing, Robinson’s Galleria, from 10am to 8pm. Starting tomorrow, August 8, until Sunday, August 12, from 10am to 6pm, Victory Alabang will accept donations at the Victory Alabang Center in Festival Mall. Starting August 8, Victory Fort Bonifacio will accept donations of food and bottled water at the ground floor of the Every Nation Building, University Parkway corner 32nd Avenue, Bonifacio Global City, Taguig. Victory Fort will also accept cash and check donations. Also, weather permitting, Victory Makati will accept relief donations of clothes, blankets, ready to eat food, and bottled water at the Victory Makati Office, Ground Floor, LPL Center Bldg, 130 LP Leviste St. Salcedo Village, Makati City. For particulars, please call 771-1212 (Victory Alabang), 631-1212 (Victory Ortigas), 817-1212 (Victory Fort), or 519-1212 (Victory Makati). If you have clothes that you don't use anymore or extra canned goods/food that you can share, you may drop it off at our branches. Donations will be accepted at all our clinics. No amount is too small, no object is not good. LBC is now accepting donations. All donations will be directly turned over to the Philippine Red Cross. Donate through MULTIPLY. Click HERE. Donate through PAYPAL. Click HERE. 2. GAWAD KALINGA (www.gk1world.org). Click HERE to donate. 3. SAGIP KAPAMILYA To know how to deposit donations click HERE. You may donate cash or cheque at ABS-CBN Foundation, Inc.
Office tel. no: +632-411-4995 or +632-415-2272 loc 3765. 5. OPERATION BLESSING How to donate? Click here. via credit card: Visit www.obphil.com to give safely online. For more information and ways to help, call or text 0922- 858-2398 (Sun), 0920-497-5558 (Smart), or 0917-581-2603 (Globe), or email us at info@obphil.com. You can help more affected families by providing them with a food package, a hygiene kit, or a set of mats and blankets. With your donation of 500 pesos, you can feed a family of five for 4 to 5 days, protect them from acquiring diseases that are common in evacuation sites, and keep them warm and cared for in their most difficult time. 4. DSWD NEEDS VOLUNTEERS for REPACKING. This will be updated as often as I can. I'm planning to clear some space in my closet and donate the clothes to the nearest donation center. I hope this post has helped you guys wondering what you can do. 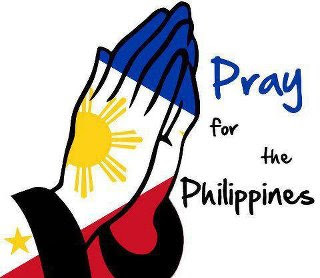 Don't forget the best thing we can do RIGHT NOW is to #PRAYFORTHEPHILIPPINES. So guys, lets PRAY and HELP each other. Follow Twitter trending topic to be updated. For more info, check out the RELIEF OPERATIONS DIRECTORY - CLICK HERE. 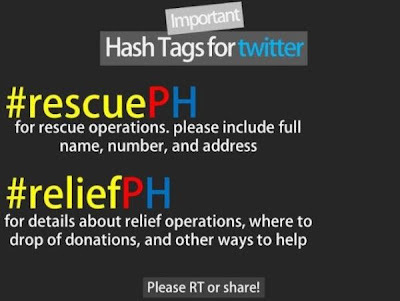 Check out thisTulongPH Relief Centers Map - Click HERE. List of Relief Operations/Donations by GMA Network - Click HERE. Google Crisis Response Page (very useful info there) - Click HERE.